Overcome Your Fears, Experience Success, and Achieve Your Dreams! How to Keep the Dream Alive! Network marketing is one of the fastest-growing career opportunities in the United States. Millions of people just like you have abandoned dead-end jobs for the chance to achieve the dream of growing their own businesses. What many of them find, however, is that the first year in network marketing is often the most challenging—and, for some, the most discouraging. Here, Mark Yarnell and Rene Reid Yarnell, two of the industry's most respected and successful professionals, offer you strategies on how to overcome those first-year obstacles and position yourself for lifelong success. The Yarnells provide you with a wealth of savvy advice on everything you need to know to succeed in network marketing, such as proven systems for recruiting, training, growing and supporting your downline, and much more. You owe it to yourself to read this inspiring book! 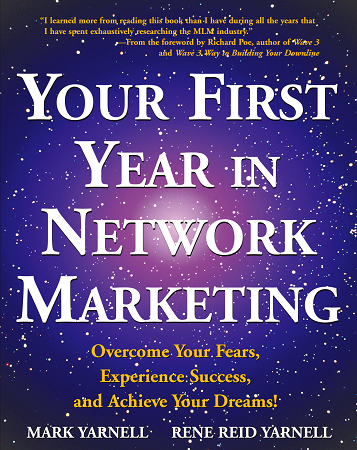 "This will be the Bible of Network Marketing." Make rejection your ally instead of your enemy. Reinforce self-sufficiency rather than dependency. Maintain enthusiasm in spite of the inevitable setbacks. Win through integrity rather than exaggeration. Overcome your reluctance to offer a quality lifestyle to family and friends. Stay focused amidst all the distractions. Avoid the pitfalls of counterproductive meetings. Recruit and train your own people instead of depending on others. Recognize the upside and downside of corporate executives joining MLM. Copyright NetworkMarketCenter.com. All Rights Reserved. eCommerce Templates by 3DCart.